On Saturday, November 19th we’ll be checking out the RE:MIX LAB presented by Antenna Magazine at the River East Arts Center. 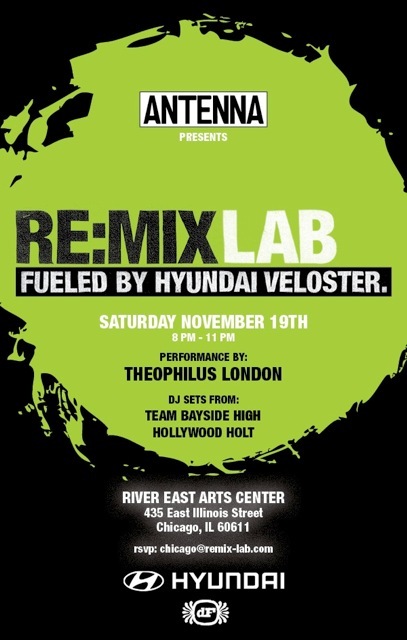 The RE:Mix LAB, fueled by the new Hyundai Veloster, is a multi-day, multi-media event, which will feature music, gaming, and film in support of the soon to be released RE:GENERATION music documentary. Theophilus London will be performing live in addition to DJ sets by local Chicago favorites Team Bayside High and Hollywood Holt. Several tracks from London’s new album Timez Are Weird These Days have been on constant rotation in my 2011 playlist, and while we were at Lollapalooza 2011 we had the pleasure of dodging the downpour inside the Dell Lounge to catch a set by Hollywood Holt. And knowing the good times we had at the WBEZ Hip Hop Block Party earlier this year, we’re looking forward to seeing how the collective groove all comes together at the River Arts Center. As you know, we’ve been exploring how brands like Honda and Scion are innovating the live music experience and engaging fans at shows and during road trips, so we’ll be talking with the artists, Hyundai and the folks behind this RE:MIX LAB event, and we’ll share our chat with them on a future episode of Live Fix Radio. Full info about the event is below. And if you have a question or a comment for any of artists or Hynaudi post it below and we’ll be sure to include it our chat.